This tree is rendered distinctive by the thick, glossy, short-stemmed, evergreen leaves which exude a penetrating, camphor-like odor when crushed. 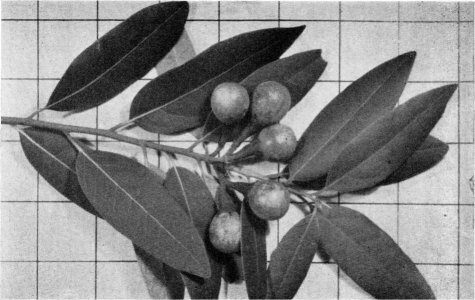 The leaves are alternate on the branches, three to six inches long, and from one-half to one and one-half inches wide at maturity. New leaves are produced throughout the summer and they persist on the tree from two to, occasionally, six years. In Yosemite National Park the California laurel, which is also commonly known as pepperwood, California bay, and Oregon myrtle, is quite common in moist, rocky soils at the base of cliffs bordering canyons at elevations from 3,000 to 5,000 feet above sea level. It may be readily noted along the highway above the Arch Rock Entrance as well as along the lower portions of many trails leading from the Valley floor to the rim. may reach three feet or more in diameter. However, in Yosemite National Park it is a small tree. Here, although larger specimens may be found, it is usually twenty to thirty feet tall and rarely more than six inches in diameter with erect, slender branches forming a loose, open, and narrow crown. It often takes the form of a many-stemmed shrub ten to fifteen feet tall — particularly in moist, shaded locations along streams in protected canyon bottoms. The bark, smooth on young trees and scaly on old trunks, is thin and varies from a dull greenish-brown to reddish-brown in color. Smaller branches are light green in color. Loose clusters of small, rather inconspicuous yellow flowers appear in the spring. The interesting, yellowish-green fruit	which resembles a large olive in appearance — is a conspicuous feature in the late summer and early fall. It consists of a large, thin-shelled, light brown seed surrounded by a thick, fleshy covering. It is ripe about October, at which time it drops from the tree.